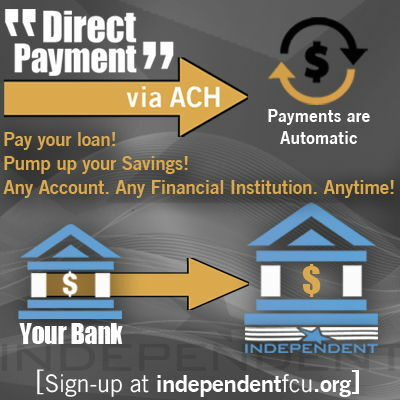 Direct Payment via ACH (Automated Clearing House) allows you to make electronic transfers from any account, from any Financial Institution TO Independent Federal Credit Union. Payments are electronic from start to finish. By signing up you can let things happen automatically and electronically. Pay your Independent Loan payment, or transfer money each month directly into your Independent Savings Account. Transactions are safe and secure, and easy to track. In addition you can reduce the potential for errors, speed up your payment process and even save on resources! No more postage! Envelopes and paper, ink and fuel are saved. There is no need to remember to make payments, no need to write out checks, no need to pay postage, and no need to wait and worry for the postal service to deliver your payment.